This post is for 30 hours per week. We are looking for a brilliant administrator with a love for history, who will provide high quality support to our network of retired Queen’s Nurses. These are delightful and inspirational women who have served the communities of Scotland as district nurses through the second half of the twentieth century and their welfare is a key thread of our work. This is a wide-ranging role that will see you involved in a variety of activities from getting to know our archival material and finding creative ways to use it, developing a comprehensive contacts database, providing cheerful telephone support to volunteers, engaging in the history of Queen’s Nursing in Scotland, sorting out expenses claims and grant application forms as well as organising events across the country. Being a small team, we also need someone who enjoys rolling up their sleeves up and pitching in with whatever’s required. The post is offered 30 hours per week. We are offering a salary of £23-25k (pro rata). We offer a 10% contributory pension, 38 days leave (pro rata including public holidays) and flexible working. For more information about the role and the organisation, please download the Excellence Profile. With a strong interest in oral history, you will have great admin skills, and you will be able to balance the demands of deadlines with a high level of attention to detail. You will be able to demonstrate effective project management and an ability to coordinate a range of admin processes at once with interruptions. Crucial to success in the role will be the ability to communicate clearly, cheerfully and tactfully with the retired Queen’s Nurses and the Volunteer Visitors who support them. At the heart of your enjoyment of the role will be your love for the stories of the past and your creativity in capturing them in ways which bring those stories to a new generation. 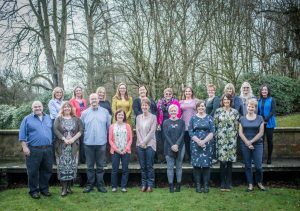 The Queen’s Nursing Institute Scotland (QNIS) is a small charity doing big things in promoting excellence in community nursing to improve the health and well-being of the people of Scotland. We support, encourage and inspire nurses employed by the NHS, independent or charitable sector who work in a huge range of roles across Scotland to really make a difference for the people they serve. Please send a CV and Covering Letter explaining how your experience matches the Excellence Profile to Dawn.Cruse@qnis.org.uk. For an informal discussion about the role, please contact the office on 0131 229 2333. QNIS is an employer that values the diversity of its workforce and welcomes applications from all sections of the community.